By selecting your Gamestar Mechanic game from the My Published Games section of your workshop, you can see the player page for your game. This is exactly like the player page: You can see reviews and comments on your game, the average rating of your game, basic statistics, and a collection of buttons for sharing or recommending the game. Here, you can play your game from a player’s perspective and read what others have to say about it. Learning from feedback and revising your games is vital to the design process and essential when learning how to master your skills. It’s bad form to review or favorite your own games, even if you try to be honest. You can sometimes comment on your own games if you think people are going to read the comment on your player page, but be sure that you’re complying with the rules of conduct (there’s a link to these rules in the footer toolbar). Every game has an easily accessible rating that’s displayed below or next to the game everywhere it appears. The rating consists of one to five stars representing the quality of the game, and one to five gears representing the difficulty. These ratings are obtained by averaging the reviews of players and rounding to the nearest half-star or half-gear. 1 to 2-1/2 stars: Don’t be discouraged by this rating! No one can create ideas in Gamestar Mechanic that are always popular. Try to figure out why some people disliked your game, and improve it. However, you might also get this rating by simple bad luck — certain people rate every game they see as 1 star (without providing good reasons), and it’s your job not to let these ratings bother you. If one or two of those people get to your game first, don’t worry — and remember that higher ratings often follow. 3 to 3-1/2 stars: This often means you made a good game, but can still improve. Read your reviews to find constructive criticism that might help you pinpoint where you can make your game better. 4 to 4-1/2 stars: This is a game well worthy of praise! In addition to improving via your reviews, try to see what players liked about this game and apply those concepts to future projects. 5 stars: Five-star games are the most likely to hit the Top Rated section of Game Alley. With an average rating of at least 4.75, these games are the best you can get; to further improve, try getting a 5-star game with as many reviews as possible. When you view the My Published Games page in your workshop, you see that each game has a View Stats button to its right. 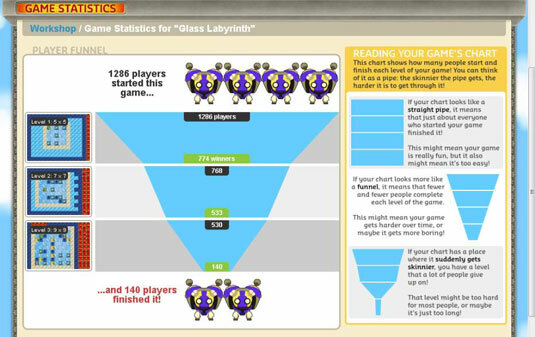 Click the button to load a funnel chart showing how players progressed in your game as a whole. The vertical axis corresponds to the levels of your game, and the width of the funnel at each level describes the percentage of players who have reached that level. This graph is useful for seeing how many players beat each level of your game and which levels create choke points in the graph where players give up.